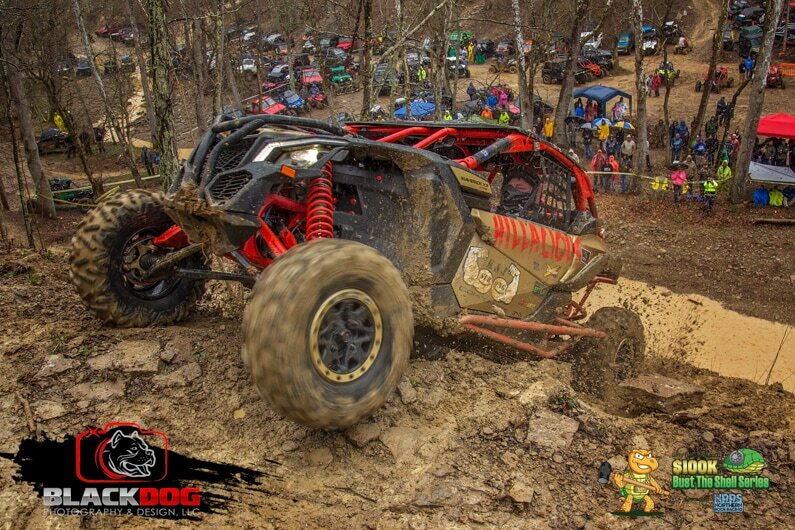 Dirty Turtle Off-Road (DTOR) Park in Bedford, KY is known for their Annual Birthday Bash and Boo Bash Events. This year the park opened their season with a new competition series at their annual Birthday Bash. This year’s 5th Birthday would host a new bounty hill event called Bust the Shell. 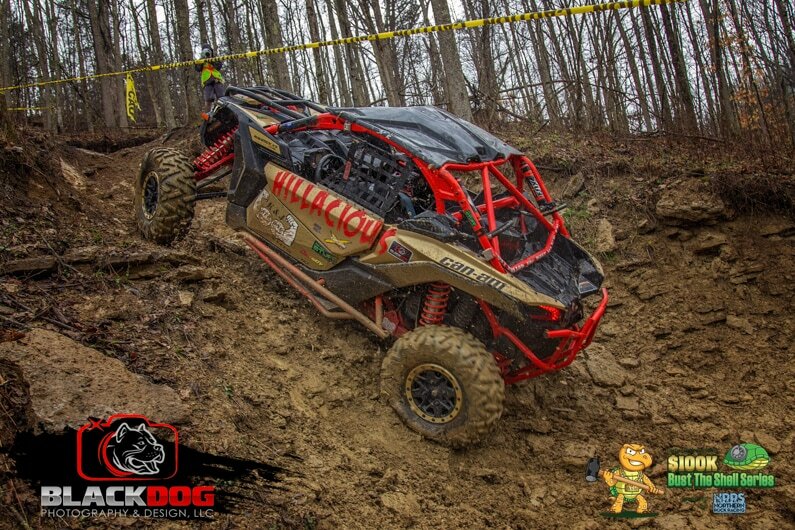 DTOR will host several of the hill climb events itself and a few of the competitions will be at other venues in Kentucky. 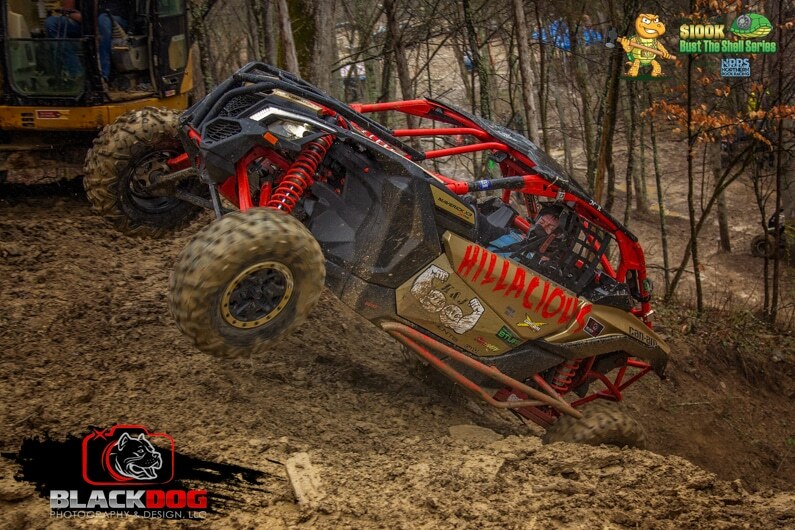 Hillacious has had great runs at the park, so I decided to run this series for the 2018 season alongside the RCV Southern Rock Racing Bounty Hill Series. Race day was a rainy one. The hill that was chosen for this event was “Bobby’s Hill”-dedicated to Bobby Tanner, the first one to ever climb it. This was my first attempt with this hill. All the other events had been in a different area of the park. With DTOR Birthday Bash in full swing, the park was full of spectators even with the rainy weather. This was our first time participating or attending this annual event. Sixteen drivers attempted the challenge of climbing “Bobby’s Hill” the morning of April 14, 2018. Each driver was given a five minute time limit to complete the task. The course consisted of going up one hill, across the middle of all the hills, back down to the bottom and then up the main section of several steep, straight up muddy ledges to the top. With the rain coming down, the hill was getting in worse shape after every buggy attempt. I was far down in the line-up. I knew that it was going to be tough. I made it up the first hill with ease and went across the middle thinking I had to hammer down to get a good time. I came down the hill at a good pace ready to fly up the next hill. After watching several buggies not make it past the next hill, I knew I had to send it. Hillacious flew up the first ledge. The second ledge was so slick that I had to attempt it four times to get a bite at the top. I kept trying to find my line without rolling the machine over. Finally, my tires stuck and I was able to get over the toughest ledge and sail on to the top over several other hills and turns. Only four buggies were able to make it to the top that day in the SxS series. 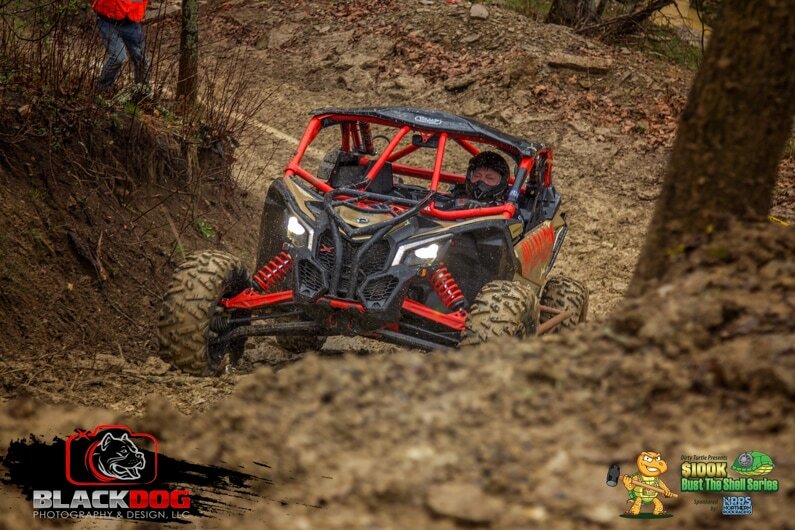 I had a runtime of 133.926, proving again that a stock Can-Am has what it takes to get the job done. 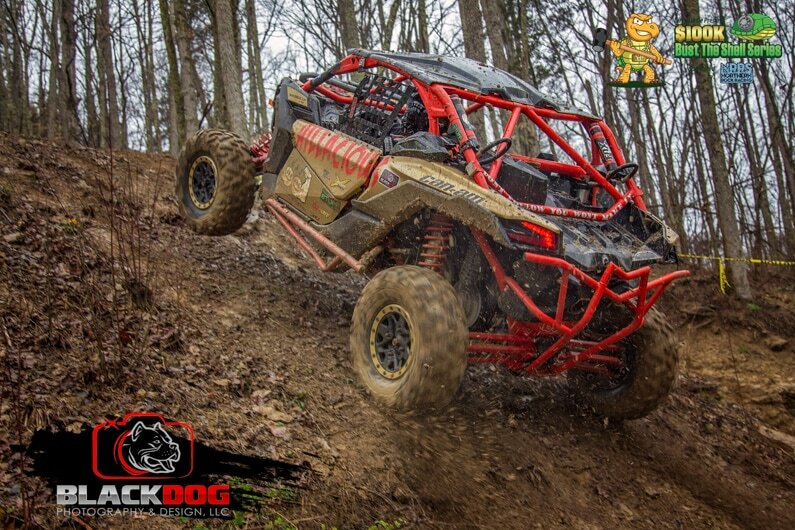 Hillacious ended up on the podium with a third place finish for the day at DTOR Bust the Shell Season Opener. It was another great day for Team Can-Am. 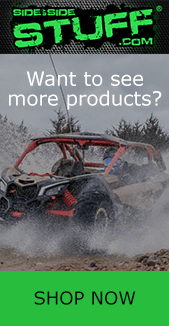 Like my Facebook page – Hillacious Can-Am – to see more videos and pics of us. Thanks go out to our great sponsors. K&J Strong Components have built me some tough, high clearance parts. Adrenaline Cycles in London, KY continues to support me with every adventure. 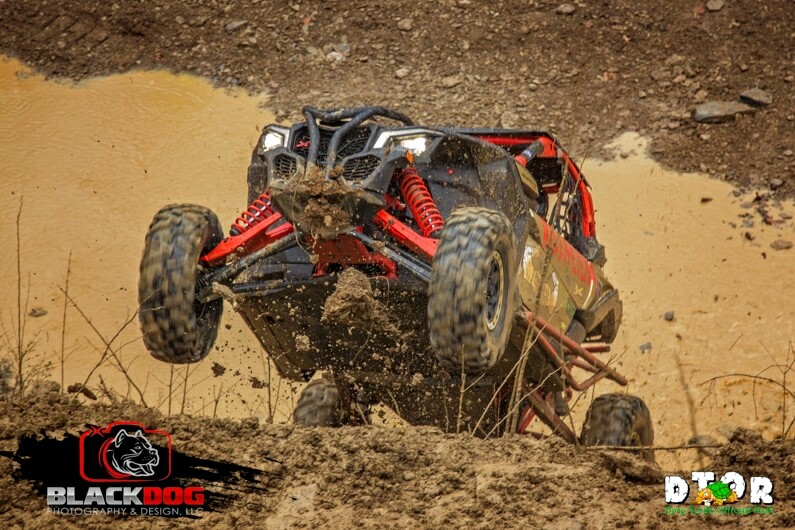 Black Dog Photography captures amazing photos at every event. My home shop, Center Street Wheel and Tire in Madisonville, KY, is my home base.